cameras, more reliable camera support makes sense. This is especially true if the camera/phone is used for low light photography, HDR or time lapse effects. Smooth high resolution video that does not induce seasickness is another reason to give the smartphone more solid support. But smartphones lack some of the functionality that cameras have. Specifically, there is no tripod thread. It is necessary to provide some sort of tripod adapter in order to mount the phone on a stable support. Fortunately there is a wide selection of devices that will mount your smartphone on a tripod or other support. These range in price from no-cost do-it-yourself devices to those for a few dollars up to around fifty. When considering a tripod adapter for your smartphone there are a few things to keep in mind. Will the adapter accommodate any size phone with or without a case? Will it hold securely without coming loose or damaging the phone? Will the phone slide in and out of the adapter easily or is it a struggle? Will using the adapter conceal or activate buttons on the side of the phone? Smartphone tripod adapters are simple, inexpensive devices but picking the right one will make your smartphone photo/video experience more enjoyable. Here are a few suggestions for tripod adapters. The list is by no means complete but will provide some direction. I’ll begin with the Adjustable Glif by Studio Neat. This is one of the more expensive devices at $30 but it has some advantages. It can be adjusted to hold any phone, with or without a case. Once it is set, the phone slips in and out of the adapter easily yet it holds the phone securely. It contacts the phone at two narrow points so covering or activating the buttons is unlikely. If your budget includes $30 for a tripod adapter, this is an excellent choice. On the low end of the price spectrum is the Dot Line Smartphone Tripod Mount at $7.95 from B&H Photo. This device is spring loaded and will take most phones with a case. It holds securely though not as firmly as the adjustable Glif. It is well made and does a good job for the price. At the mid price range is the iStabilizer at $19.95. This is also a spring loaded device and the spring tension is very tight. It will hold securely but it is rather wide. Care must be taken not to cover or activate the buttons on the phone. A slightly cheaper device is the Square Jellyfish Spring Tripod Mount at $14.95 from B&H. I have not used this product but it looks well made. It also has the advantage of horizontal or vertical orientation. At the high end of the price range is the Mefoto Sidekick, $49. This looks very well made, comes in colors, and is adjustable to accommodate most smartphones. It rotates the phone from horizontal to vertical and is self supporting on a flat surface. All of these devices will secure your smartphone to the HandlePod or any tripod or alternative support. Mounting your smartphone on a device like HandlePod, a tripod or other support provides a number of advantages. 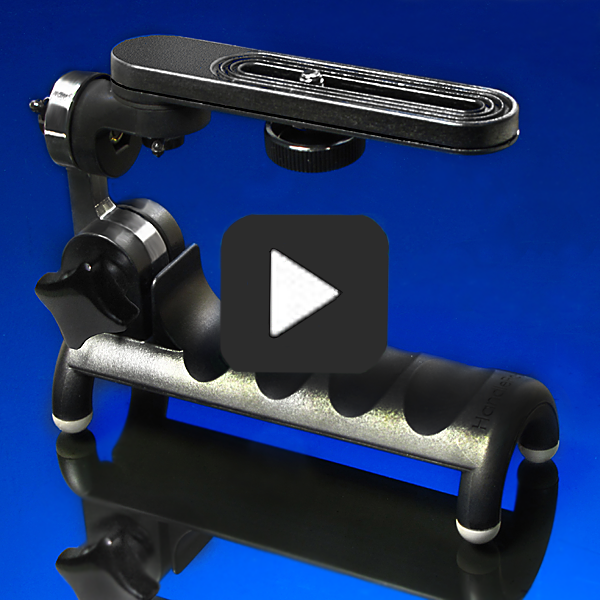 Hope you have found this brief discussion of smartphone tripod adapters helpful. This entry was posted in Tripod Alternative on November 1, 2014 by main user.